Italy recorded a considerable drop (7.2 percent) in a field in which it was always seen as in the lead in Europe. Often prohibitive costs, bureaucratic difficulties, contrasts with countries. The economic conditions of couples fustrate a dream pursued for years: few can ensure business continues when dominates increasingly precarious. But also the states traditionally available ended up closing its borders because they claim to be able to offer a decent future for their children. But is this true? ROME – Adoption, the other way to motherhood. But it is not a shortcut, far from it. Also because in Italian children declared adoptable are a thousand each year , while the questions are always more than ten thousand (even if you are recording a decline from 17 thousand in 2006 to 11 thousand in 2010, the latest figure available). Ten pairs of parents available for each child, which allows the courts to choose carefully, but frustrates many expectations. So Mom and Dad will become even, and especially, with a son who comes from afar, with international adoptions. “But to be adoptive parents is a complicated and challenging path,” says Sara P., 42, while squeezes the hand of her husband. “You cling to everything. And the only thing that helps is not to sink your child is already born and is waiting somewhere in the world – is confident Sara – You just have to find it.” Being a parent is not a right. But who decided to become one with courage, through international adoption, knows that give life to the coveted family means going on a journey of challenges and that puts a strain also patience and wallet. A world that we decided to probe again. To record a figure that contrasts with a trend typically Italian and that attributed to our country, until a few years ago, the primacy of the one with the highest number of adoptions in the world. Today this figure is in dramatic decline. Global trend. 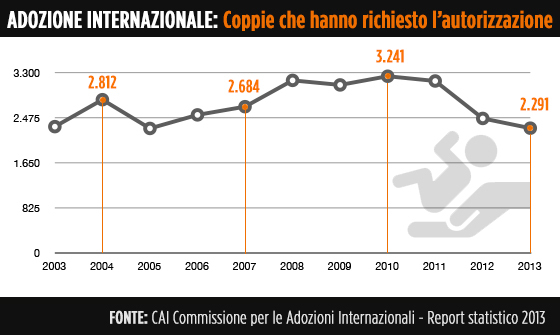 According to the latest report of the Commission for International Adoptions (Cai) , the number of Italian couples who adopted in 2013 (2291) shows a decrease of 7.2% compared to 2012 (2469), 27.3 % compared to 2011 and as much as 29.3% in comparison with 2010. A decline evident confirmed by the data for entry into Italy for the purpose of foreign children adopted. In 2013, the children welcomed in our country have been 2825, when they were 3,106 in 2012 and 4,130 in 2010. Data only but before alarmed, they must be read in the international scenario which affirms a general downward trend of the phenomenon adopted. After careful analysis, it turns out that Italy is among the ten countries most welcome, one that has been more modest in 2013: 9%, against a decline of the United States of 18% and 14% of France. The basic assumption for the world trend, which in fact has seen the numbers more than halved in less than ten years (2004 to 2012 international adoptions in the world fell by 58.6%), however, can not Regardless of reflection: Italy, second only to the United States for admission on Foster, continues to live substantial problems that prevent a raise and are holding one of the choices shared by parents eager to have a child.Costs and crisis. One factor important is the economic crisis that has hit our country, relegating to the uncertainty of the future; the less job security and the thinning of the savings will not help couples with adopted to undertake a path serenely wasteful. The costs of international adoption skim astonishing figures, up to 40 thousand euro, without adding the difficulties that may arise in the long preparatory stage. We think of the stages of deadlock, the delays to the various crises that countries that offer adoptions may suffer. Factors certainly not secondary and that ultimately affect, and very, costs. On average over the forty thousand euro. “The decline exists, it is true, how do you build a family project if there is no economic security? – Asks Luisa Quaranta, head of the Rome office of the accredited Ciai – is the same mechanism that drives us to not have more children. ” Reading the statistics on births contained in the survey of Censis “Becoming Parents Today-2013 “, according to which from the beginning of the crisis (2008) there were sixty-two thousand newborns less, the contraction is also evident on this side. In general impoverishment Italian families caused by the crisis, plus the practical difficulties related to the possession of certain economic requirements essential to be able to apply for adoption. Meanwhile, you have to pass the exam rules, provided by art. 6 of Law no. 184/1983 (as amended by Law no. 149/2001), governing the adoption and custody of children. The aspiring sets of parents must accompany the request for adoption of a series of documents – most in self-certification – including the payroll and the last tax return. The purpose is to demonstrate the economic stability of the family to ensure a standard of living adequate to support a child with health problems and sometimes even psychological critics. Today, many spouses are faced with the impossibility of being able to provide certainty about their business continuity and consequently on economic revenue, such as temporary workers or contract determined. These pairs can not help but to postpone their choice and hope for a future stabilization of their income. L and welfare policies . The decline, as theVII Report of the CRC (the Italian work group that will monitor the status of implementation of the UN Convention on the Rights of the Child in Italy) is also attributable to changes in legislative and procedural adoptions that occurred in foreign countries. But also to a greater use of the tools of foster care and adoption have been implemented through national best local welfare policies. A resurgence of national pride that has led, for example, India to commit to international adoption, only 20% of children declared abandoned or semi-abandoned and to keep within the borders of its territory in the care of the remaining 80 %. A reality – albeit with modalities and different reasons – that occurred in the Republic of China when it ratified the Hague Convention, has decided to start giving better responses to children in need of family strengthening national adoption. All this has come to stop the wave of adoptions worldwide, because fewer children needed to get out of their countries. Moreover, this should be the ultimate goal of the institute of international adoption as regulated by the Hague Convention – which Italy ratified by Law 476 of ’98 – and which in turn refers to Article 21 of the UN Convention on the Rights of the Child: “The adoption in another country can be considered as an alternative means of assistance to the child, if they can not find acceptance in a foster or an adoptive family in their home country or can not find another satisfactory arrangement in that country. “The adoption abroad, in short, is a possibility, but it must be the earlier of the possibilities. The common goal of the States that have ratified the Hague Convention, as repeatedly stressed in the various interventions by the president of the Cai, Silvia Della Monica, is that the number of international adoptions, with time, more and more tent toward zero because not necessary; This would mean that the child’s right to live in his country of origin with the proper support to its implementation would be protected. ROME – In five to six years – as noted by operators and experts – there has been an increase in the age of the children, another fact that may have influenced the decline of adoptions. According to statistical data of Cai, the average values ​​in 2013 was 5.5 years, 43.8% of children falling in the age group 5-9 years; the older children come from Ukraine (8.9 years), Bulgaria (8.1 years), Brazil (7.9 years), Hungary (7.8 years), Poland (7.7 years) and Lithuania (7, 6 years). The health of children is another key issue to be evaluated; the numbers of the monitoring are clear: 28.7% of adoptees have been reported from the country of origin as children with special needs or special, so-called special needs , with serious and often incurable diseases, such as neurological or mental problems that require a recovery over time. The largest number of children indicated with these needs come from Asia (52.6%), the continent with Vietnam (1.9 years) and the Republic of China (3.5 years) is also the countries of origin of children small, is to follow Europe with 29%, Latin America with 1.7% and Africa with 0.7%. “The race to the child at all costs must be approached with caution,” says Tamara F., waiting with her ​​husband, to take in India. The medical conditions of childrenspecial needs fall into a spectrum of situations endless; ranging from HIV, hepatitis B and C, from cleft lip and palate up to heart disease, but psychological problems should not be underestimated. The possibility of being a victim of abuse and neglect is independent from both the geographical context that age registry. Highly problematic. Since Ciai warn: “We are careful when we talk about special needs , not all children are highly problematic; those children who are more difficult in home can be adopted because they have characteristics that couples do not like very local. In addition to those with health problems more or less serious, there are also minor aged seven and up, groups of three brothers who can not be divided or those heavy with stories behind “. “With special needsin international adoptions do not mess around, “warns Anna Warriors president of the National Association of parents becomes , non-profit organization that deals with preparation, information and support on issues related to pre- and post-adoptive paths. “In the self help groups – precise – we talk with many families with children in difficulties, difficulties that are not absolute, but weigh, like not being able to complete their studies or find a range of non-life balance “. It must be said that couples are not left alone in the post adoptive. Besides the help of associations of adoptive families is the local social services, with a staff that should be enhanced, which authorized institutions, with interventions that should not be limited to formal, offer support for the inclusion and integration of the child in family and society. Mistrust in procedures. On the other hand also what the VII Report CRC defines a “sense of confidence” towards a procedure judged long, cumbersome and uncertain outcome contributes to the decline in the number of international adoptions. The average time that the couple used the availability presented in court at the entrance to the authorization of minors in Italy was, according to the latest report of the Cai, 3.3 years, with peaks of 5.5 for those who have adopted children from Lithuania and minimum peaks of 2.8 years for the Russian Federation and Hungary. More than the timing, discourages uncertainty, not knowing when it will arrive within the future child, and in this context of delays, delays, bottlenecks, they fit both foreign bureaucracies, which for obvious reasons are not directly controllable by Cai, both expectations for the performance of Italian practices.